#RajkumarHirani, who is good friends with actor #SanjayDutt says that his life story is “Unbelievable” but “True”. Filmmaker Rajkumar Hirani and actor Sanjay Dutt have collaborated for Munna Bhai series and now the director is all geared up with actor’s biopic, Sanju, which stars Ranbir Kapoor in the titular role. Hirani just released postcard styled new posters from the film, and both the posters depict struggling and delicate time in actor’s life. 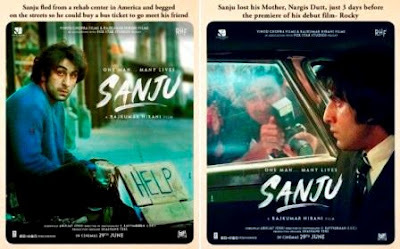 In one of the posters, Sanjay Dutt is begging on streets during his drug-struggling days to save up enough money to meet his girlfriend and the second poster is even more heart-breaking. It is the premiere of his debut movie but unfortunately 3 days prior his mother, veteran actor Nargis has passed away. The film is written and directed by Hirani, the movie also stars Sonam Kapoor, Dia Mirza, Karishma Tanna, Manisha Koirala, Jim Sarbh, and Boman Irani in important roles. The movie chronicles the struggling and controversial life of Sanjay Dutt. The film will follow actor's life, mainly through three stages, during his drug addict phase, his many love affairs, and during the phase of his life when he went to jail under TADA case. The Trailer for the film is already out and viral. Ranbir Kapoor has done a remarkable job portraying different and unknown facades of Sanjay Dutt’s life. Sanju is set to be released on June 29, 2018.